[...] Besides providing revealing insight into ISIS money-making, the note supports the previous suppositions that ISIS is selling artifacts via the same trade route, which, according to what RT’s crew was told, it used to bring across weapons and supplies, right under Ankara’s nose. No information is provided on where this note was found, and in association with what. Was it on the body of Brother Hussain? Note, there is no indication on which section of the border this border post was supposed to have been, nor any reference to the commanding officer. Nor is there any indication of a date. The name Abu Uafa A[l]-Tunisi appears not to be known (?). It could be the name of an operative who replaced Abu Sayaff (Fathi ben Awn ben Jildi Murad al-Tunisi) killed in May 2015. Searching for this name suggests that it could however as easily be a pastiche of the names of two militants killed recently in drone strikes in the region, We note however the suggestion that an ISIL official ("Hussein Hania Sarira") went across the border into Turkey with the antiquities trader (who is not named). This would be an explanation on how the tax could be assessed and collected from sales taking place outside Syria and Iraq. (They'd probably have sat down together and shared meals on the journey - raising the issue of who portable antiquity dealers associate.) If this document is not a forgery, it also means ISIL officials had no problem entering Syria from Turkey. The documents which RT claim to have seen suggest that the oil from the region is being taken west by "intermediaries from Raqqa and Allepo" and thence across the border to Turkey. 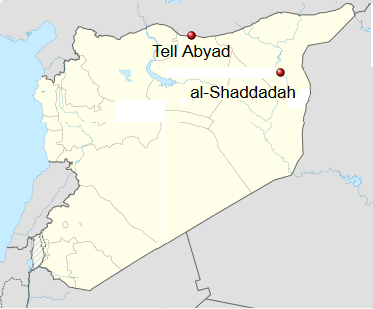 As noted on this blog earlier, the loss of Tel Abyad to YPG advances last summer probably has dealt a severe blow to Islamic State activities and its trade routes ("as well as direct commutation lines with representatives of Turkish security services: adds RT). Any movement of foreign fighters in and out of Syria on this route would have been curtailed. discovered by the Kurdish YPG troops after they liberated Shaddadi from jihadists in February 2016. No one knows where those objects originally came from, but Kurdish fighters also found an old map in French, which could date as far back as colonial times. It indicates the excavation grounds. (The 'old map motif' recalls the 'Books among the Bombs' story I covered a while back). I am in two minds about the authenticity of this report. Let us see some more independently-verifiable evidence. There is of course nothing inherently improbable in this, the town is just north of Deir ez Zor, a region where there has been looting of sites (though not only by ISIL) for long enough for the traces to be visible in my survey of the Google Earth shots before other later imagery became available. I have covered evidence of looting in the province in a number of past posts here.